Here is are two charts showing the distribution of customer tags on Amazon.com for Ann Coulter’s Godless: The Church of Liberalism. The first shows tags 1-25; the second all 881 tags. The distribution is not too far from the classic “long tail” pattern common to social data. Although the common tags are common, fully 75% of the tags are used only once. It’s an even better example of another characteristic of social data, that “user generated content” is all about context, not just object. LibraryThing members and Amazon customers are tagging the same book. But while, on LibraryThing, where you have to have a book to tag it, Godless has a fairly unremarkable tag cloud, touching on its subject matter and point of view, on Amazon, the tagging has devolved into a shouting match. I don’t think the people who tagged the book “asshat,” “vomit” or “w h o r e” are using tagging as a memory aid (“I forget—what books did I think are ‘asshat’ anyway?”). They’re using tagging as a sort of drive-by review. Now, a case can be made that Amazon’s tags are signaling something important—this is a “controversial” book indeed! The LibraryThing tag cloud doesn’t show that as starkly. On balance, however, I think opinion tags corrupt the value of tagging. Either way, I think this example demonstrates that tagging isn’t a simple matter of putting users in front of taggable stuff. “Walk into the public library in Danbury, Connecticut, and you’ll find the usual shelves stacked with books, organized into neat rows. Works of fiction are grouped alphabetically by the author’s last name. Nonfiction titles are placed into their propper Dewey Decimal categories just like they are at tens of thousands of other libraries in North America. But visit the Danbury Library’s online catalog, and you’ll find something rather unlike a typical library. 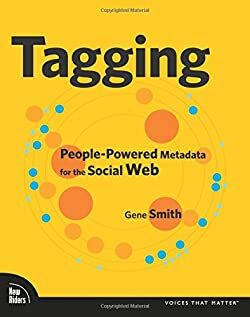 So begins Gene Smith’s newly released book Tagging: People-Powered Metadata for the Social Web (New Riders). That’s right. The first book dedicated to tagging begins with LibraryThing—specifically our LibraryThing for Libraries project! Library 2.0 people pause a second. How about that: a book about new developments in social media starts by talking about new things going on in a library? Not a social networking site, not a photo sharing site. A dream come true. That’s all I have to say for now. I knew the book was coming; Gene interviewed me for it (selections on page 134). But I haven’t finished it yet. My first impression is that it’s rich and detailed, covering everything from what tagging is and why it matters, to how to implement it at the level of user interface and even technically. But But, as is my wont, I’m already scribbling little objections and expansions in the margins. That’s the sign of a good book, right? I’ve created a discussion group on Talk for people reading the book. Come join me to talk about it. Has anyone seen click-based tag clouds? These are tag clouds in which the size of the words depend not on the number of times something has been tagged, but on the number of times the tag is clicked. I never had, but Abby just spotted on the website of the the State of Delaware. Apparently site visitors are interested in employment. It’s a pretty cool idea, and one I’d love to try out on LibraryThing. It wouldn’t work on work pages, but it might on the home page. And I’m impressed that it was on state-government site. While these sites are increasingly competent, they’re not usually thought of as a hotbeds of web innovation. What does tagging do to knowledge? We ended up with a dozen or so left over, so I held a contest to get rid of them: Say something about what tagging means, or what it “does” to knowledge, and you might win a copy. I figured that it was time to stop pontificating about what people were doing with tags, and get them to pontificate instead. The Talk topic eventually accumulated 170 comments, almost all interesting and some quite lengthy and involved. I found it thrilling stuff. We picked ten random winners, and sent out the books. The whole discussion is newly relevant in light of our new Tag Mirror feature, discussed on the main blog and at in great detail on Talk. I remember being flabbergasted when I found out how long it took for the Library of Congress to change the subject heading “Vietnam Conflict” to “Vietnam War.” Now it doesn’t seem so ludicrous to me. As I’ve argued elsewhere and in my Library of Congress talk, problems 1, 2 and 3 are mitigated by having LOTS of tags. Idiocy, malice and personal junk fall out statistically. A tag here or there can’t be trusted, but a large body of tags in agreement is different. Some day–when I become a better programer?–I’m going to try this on LibraryThing data. It will help with ambiguity—the secondary tags on the various meanings of “leather” are surely wildly divergent! But I suspect it separates better than it clarifies. 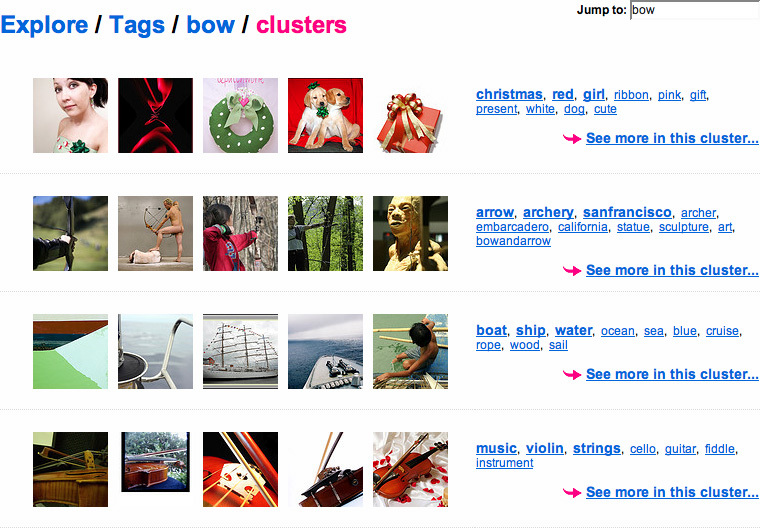 Flickr supposes that tags fall into discrete clusters, but subjects interact with books in extremely complex ways. On a more basic level, I am suspicious of the too-quick resort to algorithms against user data. *** After all, if computers are so good at figuring out meaning, why were users necessary in the first place? It smacks of technological revanchism. Now let’s take the “focusing” power of hierarchy. As mentioned above, there is no good way to get at “france during wwii.” The tag Vichy covers some of the ground, but not enough. Tagmash provides an answer. Of course, both trees are equally artificial. 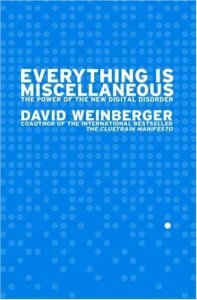 David Weinberger writes how, in the real world, a leaf can be on many branches. But it’s equally true that what’s trunk and what’s branch are largely about where you start–dirt or pinecone. Either way, branching happens. The order of the branches isn’t necessarily important. But tagging has no limits. Think of the tagmash “erotica” and “zombies” and there it is. (Tagmash: erotica, zombies). Want to know what chick lit takes place in Greece? (Tagmash: chick lit, greece.) Young adult books involving horses? (Tagmash: horses, young adult.) Poems from or about San Francisco? (Tagmash: poetry, san francisco). Slavery in Brazil? (Tagmash: brasil, slavery.) Non-fiction books about Narnia? (Tagmash: narnia, -fiction.) The options are endless. Of course, tagmash only narrows the gap. It doesn’t eliminate it. Tagmash: poetry, San Francisco still can’t distinguish between poetry about and poetry from San Francisco–it involves whatever is tagged “San Francisco” and that’s probably a mixed bag. ***** Well-planned and carefully executed subject systems have strengths that no ad hoc, regular-person system can match. Lastly—let there be no doubt—tagmash needs a very large quantity of tags to work. For tagmash after tagmash, the data is simply insufficient. The syntax can include non-tag factors, such as formal subject headings (Tag: zombies, LCSH: love stories), languages, dates, authors and so forth. The syntax can include weights (eg., Zombies 50%, vampires 50%, love stories 90%). Abby and I experimented with just such a system, creating algorithmic proxies for BISAC (bookstore) headings. It isn’t that hard to do. Complex mashes could acquire titles and other metadata. Users could follow a tagmash, and be alerted whenever new material enters the list. Amazon calls its static, or dead, lists “Listmania.” All these tend to create a “Zombie Listmania,” lists of books that “won’t stay dead.” Instead, they change over time, as the underlying social and non-social data change. There’s no reason you couldn’t create “Zombie” versions of formal subject headings—a series of tags and other markers which approximated the content of a professionally-assigned subject heading. Pretty cool idea, I think. We’ll see what we can do about it. Tagmashes can be made from any tagmash or tag page. Just search for a tag or two or more tags with a comma between them. The URLS are the same /tag/ plus a tag or tags separated by commas. The weighting of tags is wiggly. We’re trying to get at both raw numbers of tags on an item and the relative salience (number divided by total number of tags), and then cross this data tag-by-tag. There is no obvious answer. In an ideal world, some tags would about salience (eg., humor) and others would be threshholds (eg., fiction)–that is, when you’re looking for humor, fiction you want the funniest fiction, not the most fictional humor. A single minus (-fiction) “discriminates” against items tagged “fiction.” A double minus (–fiction) disqualifies all books with the fiction tag. Tagmashes don’t get built until someone builds them. The first time can take a while to generate. There is currently no system to expire older or underused tagmashes. UPDATE: I’m seeing a lot of part/whole tagmashes. These rarely work. When you search for “Einstein, science” or “Manet, art” you’re not doing much more than putting a statistical cramp on the smaller of the two tags—a few Manet books won’t have an art tag, and that will be the end of them. Tagmashes work with different things, not a thing and its category. **I’ve left out one problem, not covered at the LC—how “democratic” weighting can put Angela’s Ashes at the top of the Ireland tag. books. I want to write a blog post on the topic sometime. I think there are ways around it, and algorithmic solutions that nobody has really tried. Aside: Much LIS anti-tagging polemic focuses on the most trivial of problems—spelling mistakes and “incorrect” tags. The former underestimates technology, the latter insults our intelligence. LibraryThing has dealt with the spelling problem, and has seen very few “wrong” tags. In fact, there are some serious problems with tagging. But you have to understand tags before you can see the problems, and many refuse to get past the idea that people will spell “white” wrong, or tag white horses as black. ***This is half formed. I have a problem with the reflexive “turn” from people-centered data to algorithms. I see this pattern again and again in software. Something transformative happens–something human. But it’s imperfect, so programmers conclude that programs will fix humans. In a way, it’s a reassertion of importance. More often, humans fix humans. To adapt David Weinberger, the answer to user-generated data is MORE user-generated data. ****Probably there’s got to be some system to expire unused clusters. *****UPDATE: After turning the feature loose I watched what new tagmashes would be created. One was children, cooking. Should I call the police? REMINDER: LibraryThing is offering $1,000 worth of books if you find us an employee! As usually argued, tags have “low cognitive cost,” a high-cognitive cost way of saying “you dash them off.” You grab the book, you tag it “cooking” and move on. That usually a good thing. If you thought about it, you might try to come up with the “perfect” phrase, like “food preparation,” to cover salad-making and other methods that involve no actual cooking, or “food preparation, presentation and related subjects” to cover that book about creating beautiful designs in coffee foam and the manual that came with the Salad Shooter. But coming up with the perfect phrase takes effort and time. You pay for it then and, more importantly, you pay for it when you come to search–for searching is even more about low cognitive effort than tagging. This much is standard. It’s also clear that “dashed-off” terms cluster well socially. For most domains there are only a few simple terms (eg., cooking, cook books), but an almost endless number of complex ones. There are problems with this. Indeed, all the “problems” with tagging stem from it. A careful, formal system would distinguish between books about “leatherworking” and books of “leather erotica”. On LibraryThing, both tend to get tagged leather. I won’t multiply examples I’ve discussed before, so I can get to a new one: the Power of Suggestion. Yak, yak, yak, yak. Joke, joke, joke, joke! Now, what is the white of an egg called? Did you think “yolk”? I’ll bet you did. The children’s joke illustrates something about the brain works. Rapid thought is open to the power of suggestion. Now catalog and tag the book 9-11 by Noam Chomsky. I’ll bet you tag it “9-11.” The same goes for 9-11 emergency relief, 9-11 : artists respond and 9-11 : the world’s finest comic book writers and artists tell stories to remember. But elsewhere, “9/11” (with a slash) is by far the dominant tag. Sometimes seeming synonyms actually encode a difference in nuance or perspective (eg., Shirky’s example of “film” vs. “cinema”). In this case, they don’t. There doesn’t appear to be any real difference between “9-11″ and “9/11″ that can’t be explained by the tile. This is why LibraryThing users have “combined” the two tags, an operation we allow, and the combination has not been contested. Titles influence how we tag things. Most of the books on birds and birding could be tagged with either term, but books with “birds” in the title rank higher on the “birds” tag. Or take Heilbroner’s The Worldly Philosophers. My brother, Oakes, once pointed out, Helbroner’s book about the history of economics is almost invariably to be found in a used bookstore’s “Philosophy” section, not in “Economics.”* On LibraryThing the problem isn’t so acute, but it’s there–152 people have tagged it “economics,” 75 have tagged it “philosophy,” the second-largest tag. Of course, there is some legitimate cross-over between the two subjects. But I don’t think the content alone would merit so much “philosophy” tagging. This isn’t a perfect example either. It would be interesting to know how many of the “philosophy” taggers had read the book, or what their other tags for it were. But I think it shows a pervasive effect. The “Power of Suggestion” isn’t a major problem with tagging. But in showing us a flaw, it clues us in to what it’s all about. *He showed me this when I was quite young, and it stuck. So when I’m in a new bookstore and passing the philosophy section, I often do a quick check to see if my old, confused friend is there again. I’m weird.